Subject: What Happened at the OPEC Meeting Today? Early this morning, the cartel announced it would maintain its collective output at 30 million barrels a day. The decision marks the second time since November that OPEC will defy the global supply glut and weak oil prices. WTI prices immediately responded to the OPEC meeting by falling 2% to below $57 a barrel. WTI futures for July delivery were on track for a 3.8% weekly fall. That would be the first weekly loss for the U.S. benchmark since March 13. Brent prices are headed for an even worse weekly loss of 6%. The OPEC meeting showcased the cartel's continued struggle to keep a grip on its market share. According to CNN Money, OPEC used to make up nearly 60% of the global oil market. Its dominance has since shrunk to 40% due to surging U.S. production. "They are cornered," Fadel Gheit, managing director of oil and gas research at Oppenheimer, said to CNN Money. "Their backs are against the wall. They can only pretend they have a choice." But OPEC has been lying about keeping daily output at 30 million barrels. In fact, the cartel has been producing well above that ceiling for months now. Over the last four months, OPEC's production has surpassed its established ceiling of 30 million barrels a day. 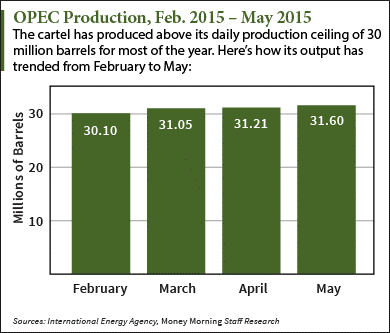 The cartel's output has increased each month, with last month's output more than 5% above the ceiling. "The consequence of OPEC's decision is really to entrench a supply surplus," explained BNP Paribas analyst Harry Tchilinguirian to The Wall Street Journal. "It will take time to erode the supply surplus in global markets, possibly beyond this year." In fact, he sees production becoming drastically reduced by July due to the shrinking rig count in the United States. Baker Hughes Inc. (NYSE: BHI) recently reported that the number of active North American rigs has fallen 53% in the last year. More rigs are going offline because primary extraction levels from oil wells typically occur within the first 18 months. After that period, each well experiences a decline in production. "The reductions are going to come from the larger, deeper, horizontal/fractured, and much more expensive projects," Moors noted. "The extension of vertical, shallow pattern drilling emphasizing known basins and low-cost operations will actually be encouraged in this kind of climate." 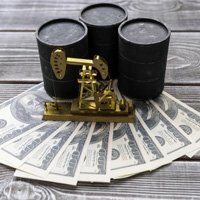 What do you think about the OPEC meeting? Talk to us on Twitter at @AlexMcGuire92 and @moneymorning.